Did it look like the photo/drawing on the pattern envelope once you were done sewing with it? As close as its going to get. Might I add, I have done a lining before in this coat and it worked out fine.... still scratching my head on how I couldn't get the lining right in the vest though. What did you particularly like or dislike about the pattern? I’d purchased a Vest from The Loft and really liked the look and style and figured I’d sew the next one. Not sure if it was me, but the pattern called for cutting lining pieces for the back, side front & side back, but not for the yoke back. So thinking there was an error in the amount of pieces to be cut for the lining, I cut out the lining piece for the yoke back, sewed the seams and left an opening in one of the side fronts, however as previously stated, I was having major issues with turning the lining and omitted it. For the armholes and hemline, I serged and folded ¼ to the inside and final stitched, and used blue hem tape along the inside edges. Oh! How could I forget…. working with pinstripe was a total PITA… again spent a considerable amount of time trying to line up the pattern pieces and to realize that it was not the case....uggh. Fabric Used: I used a navy blue pinstripe polyester blend fabric. Pattern Alterations or any design changes you made: I cut a size 16, but ended up removing 5/8 from the side seams and noticed after finishing that I should have taken ½” or less from the under arm. I have what appears to be poofing near the front of the armhole, which may be the result of trying the vest on without a blouse under it. Conclusion: Have not officially worn it, however, I did try it on with pant & button-down blouse and it looked just ok and the poofiness isn’t so noticeable. Well it sure looks good! 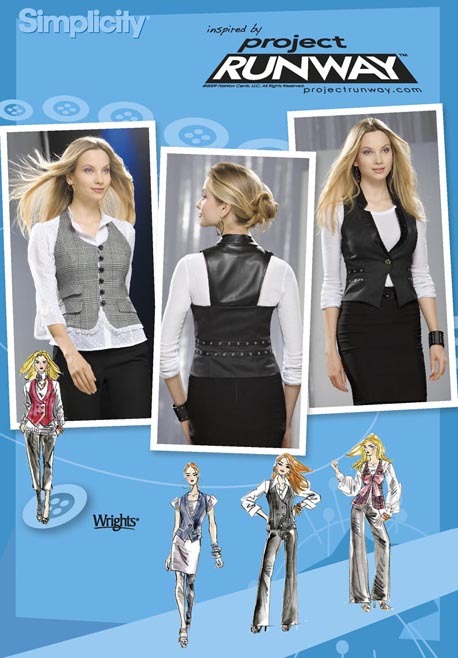 :) And I like that you chose a classic navy pinstripe to make this trendy version of a vest! I like it, classy pinstripe and the back is an interesting shape for a vest. I agree, the vest does look very good. I do understand what you went through with the lining and the time invested. I made a vest a little over a year ago and ran into the same problem with the lining and the time frame. Thus I haven't sworn off on vests, but I haven't made another one as of yet. I just don't think it should take so long to make such a little thing! Even tough this pattern frustrated you, it turned out looking pretty good :) I too like the pin stripe fabric. Nice vest. I really like it. I hope you take a picture in it for us to see. I like the closure and the bottom v's. The blue is a very nice shade too. Should make for a fly outfit. This pattern is on my must have too. I love your pin-stiped vest and can see many more variations. This pattern is growing on me. I love your pinstripe version and I can see that you'll do other versions. Very cute! I love this pattern. Just need to find the opportunity to make it! Love it. Especially the back. I looks good to me! Love to see you in it. Love it and I like the pinstripe contrast where it didn't line up, just act like you did that on purpose lol. I'm not a fan of project runway patterns, I've made one and now I avoid them. It looks great! Very classic and timeless! Thanks for the awesome compliments. I plan to take it in a tad bit in the side seams and thinking about another button & buttonhole. Also still in the process of finding the right blouse to wear with it. @ Faye: I so agree with you, I thought it would be an easy project too. I like the way the back of the vest looks. The squared off arm holes are different.